If you’re looking for a change from Texas Hold’em then there are are a number of similar community card variations available which can broaden your poker playing repertoire. Cincinnati is a reasonably popular variant and perhaps better suited to home games than casino play. Community card games are so called because players share one or more cards which are placed in the centre of the table. 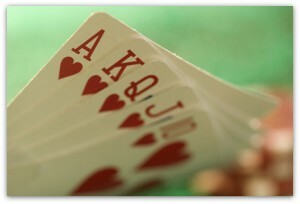 The aim of Cincinnati is to create the strongest five card hand according to standard high poker rankings. It can be played with blinds or an ante. After the blinds or the antes have been placed, the dealer distributes four cards to each player and also places five cards face down on the table; the latter are the community cards. Now the dealer reveals one of the community cards at a time and after each one there is another round of betting. Assuming there are at least two players remaining in the game after this final reveal, the showdown takes place and the hands are compared according to standard poker rankings. A player’s hand may consist of any five cards from his/her hand and the community cards. The player who holds the highest card which matches the suit of the last card turned over splits the pot with the strongest hand. The suit of the last card turned over becomes wild. We prefer to keep it simple though; the two variations above tend to negate any skill involved in Cincinnati.